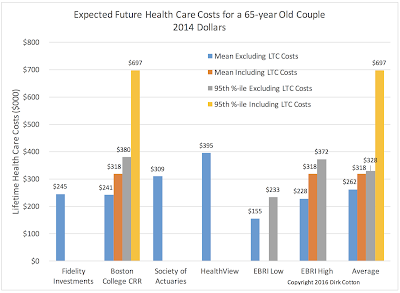 When I recently posted about a highly-circulated report from Fidelity Investments estimating the expected lifetime cost of health care for a 65-year old couple today at $245,000, some readers were skeptical. Fair enough. We should question the motives of the authors of any study, and one assumes Fidelity generally has a profit motive. There were also complaints that Fidelity published only the expected value of $245,000, so we don’t know the distribution of those expected costs. Fidelity's estimated $245,000 includes the cost of deductibles and co-pays, premiums for optional coverage for doctor visits and prescription drugs, and out-of-pocket expenses for prescription drugs. It does not include long-term care or most dental care. I queried Fidelity regarding the distribution of those expected costs, but they informed me that the information is considered proprietary. That’s OK. There are multiple sources for this kind of data, so I pulled a few of them together for a comparison. ". . . the mean and 95th percentile of remaining lifetime health care costs, including the cost of nursing home care including . . . Medicare, Medigap, and retiree health insurance premiums. . . are $260,000 and $570,000, respectively." nursing home care. . . including insurance premiums. . . the age 65 mean and 95th percentile amount to $197,000 and $311,000 ." “The average lifetime retirement health care premium costs for a 65-year-old healthy couple retiring this year and covered by Medicare Parts B, D, and a supplemental insurance policy will be $266,589. (It is assumed in this report that Medicare subscribers paid Medicare taxes while employed, and therefore, will not be responsible for Medicare Part A premiums.) If we were to include the couple’s total health care (dental, vision, co-pays, and all out-of-pockets), their costs would rise to $394,954. Lastly, the Employee Benefit Research Institute (download PDF) provides expected health care costs for 65-year old couples broken down by the need for prescription medicines. Their estimate ranges from $150,000 for median prescription drug usage to $220,000 for high usage. Their 90th percentile estimate (not 95th!) is $255,000 to $360,000. Here is the more-precise data in tabular format. Although Fidelity Investments took it on the chin from some readers for an expected cost appearing too low and for not publishing a standard deviation or 95th percentile estimate, their expected value is almost identical to that from the Center for Retirement Research and only 6% below the average of all studies. EBRI's expected cost was even lower. Furthermore, among the five studies listed, only two provided a 95th percentile expected value. Why would studies exclude long-term care costs? Medical expenses excluding long-term care are significantly easier to predict than long-term care expenses, so it makes sense to think of them separately. You may have retirement-threatening long-term care expenses or none, at all, but you will undoubtedly have substantial "other" medical care expenses. The two are insured differently, as well. Medicare covers medical expenses (though, not all) but not most long-term care costs. Long-term care is covered by LTC insurance or Medicaid. So, there's another reason to think of them separately. They are different and distinct risks. According to AARP, health care costs will consume most of the future Social Security benefits for some households. According to Fidelity Investments, their 2015 Couples Retirement Study showed that "nearly three-fourths of couples surveyed said being able to afford unexpected health care costs in retirement was their top concern. However, only 22 percent of couples had factored it into their financial planning." It should be near the top of every retiree's list of concerns and factored into everyone's retirement plan. Nearly three-fourths surveyed by Fidelity said affording health care costs in retirement was top concern, but only 22% planned for it. Even the best-case predictions for lifetime health care costs in retirement will threaten the budgets and sustainability of many households. Health care costs should play an important role in retirement budget planning. Estimate them as accurately as you can for your individual circumstances. Consider the averages a starting point and Google costs for health care and long-term care in your geographic area, and consider your own health. Because this key budget item is so unpredictable, especially the long-term care component, consider reducing your overall spending a bit to provide some safety margin. Look at long-term care costs separately. They can break the bank. When we combine elder bankruptcies caused by medical expenses with those caused by credit card debt spawned by medical expenses, health care costs are the greatest bankruptcy threat to retirees. Protect your retirement assets from creditors as best you can. Thanks for doing the research and going far beyond the simplistic Fidelity number! What a great service your are doing for readers of your blog! In your summary, you say "Plan for expected (mean) health care costs..."
This can be sensible if you are only planning for a median life expectancy (and have no serious health issues). But suppose your financial plan is for you and your spouse to live to age 95? Wouldn't you want to plan for the mean health care costs that would specifically pertain to those longevity assumptions? I meant plan for "expected annual health care costs." I'll word that better. If you're planning for age 95, expect 30 of those. Thank you very much for this blog post, all the time and work that went into making it so comprehensive and then adding your list of implications. Very nicely done. For my own retirement planning, I have found this expense area to be the most difficult to try to predict beyond the first few years as it seems the cost area that one has least control over, especially the costs that occur in the last 2-3 years of one's life where they spike enormously for many people. I hope you will continue to come back to this topic and how to deal with it in the future. Thanks again for the great work and sharing it. AppHound, I think it is one of the biggest planning question marks for everyone and I wish I could add more to your observation. I will say that being aware of the risk, even if you can't eliminate it, puts you in a far better position than not understanding the risk, at all. It should, for example, convince you to be more conservative with other parts of your plan. I am not sure how concerning these lifetime total cost numbers should be, for the reason that most people are already factoring health insurance premiums, copays, etc. into their budgets. It isn't as if these are new, unexpected costs. Doesn't everybody already have expenses like these? In fact, most people are rather pleasantly surprised at how much their expenses go down when they first go on Medicare with a good supplemental policy; I know we were, especially after having paid individual health policy premiums (both self-employed). Even through my husband's many treatments for cancer, to which he finally succumbed, we were spending about half what we had pre-Medicare. Our kids are struggling more with health insurance costs than I am. It is long-term care- the new added expense-- that is the big scary deal for me. Potential LTC costs are big and scary, as you say, and there is no great financial solution to that risk. - Health care costs are a major cause of elder bankruptcy filings. Nearly all of those filing will have had Medicare coverage, but Medicare coverage, even with Medigap, doesn't cover all expenses. The cost of insurance premiums is only part of the problem. - The cost of health care will soon devour most of the Social Security benefits of many families. I hope you are correct, but I doubt that many people will be pleasantly surprised by their health care expenses in retirement. In short, my posts have tried to caution you against precisely what you seem to be doing – underestimating the risk of health care expenses. I take the point about my underestimating the inflation of medical costs in toto. But, being already retired, not yet spending any of my IRA withdrawals, living frugally and keeping my LTC policy paid up--- beyond that I am not certain what else I should do. Keep exercising and thinking healthy thoughts, I guess. I was exercising when I injured my rotator cuff, so that's not foolproof, either! - Accept that health care costs and insurance premiums are unpredictable. Don't become overconfident in your financial plan even if you have oversaved. You say you're frugal, that's a good start. - Buy LTC insurance if you can afford the premiums but don't have enough savings to self-insure. You're good there, too. - Do your best to protect your assets from creditors in case the worst happens and you file for bankruptcy. You have a lot of risk here. There is the risk of your LTC premiums becoming unaffordable, the risk of unavoidable, uncovered medical expenses, the risk of higher health care cost inflation, and the risk of insolvency as the result of medical expenses. The first step is being aware of the risks. Sounds like you're off to a good start. "Fidelity's estimated $245,000 includes the cost of deductibles and co-pays, premiums for optional coverage for doctor visits and prescription drugs, and out-of-pocket expenses for prescription drugs. It does not include long-term care or most dental care." So Fidelity did NOT include Medicare/Gap/Advantage premiums? Fidelity doesn't say specifically, but they do mention "costs not covered by Medicare" we're included. I assume that is covered under "optional coverage for doctor visits", since Medicare A is hospitalization coverage. Other sources that covered the Fidelity article, including Bloomberg, specifically say that Medigap costs were indeed included in the Fidelity analysis. The Fidelty estimate is quite close to other estimates that included Medigap, so my assumption is that those premiums were included. But if you want to be safe, ignore Fidelty and use the estimates from sources that provided more information. Some of the estimated health care costs are in a light colored font that are so light I cannot see/read them in both the email version of your blog and when I read your blog on my iphone. This has been a problem in the past too. Can you use a darker color when you want to highlight something please? Thanks. Yes, I will for future posts. Or email me at JDCPlanning@gmail.com and I will send you an updated version of your current email. 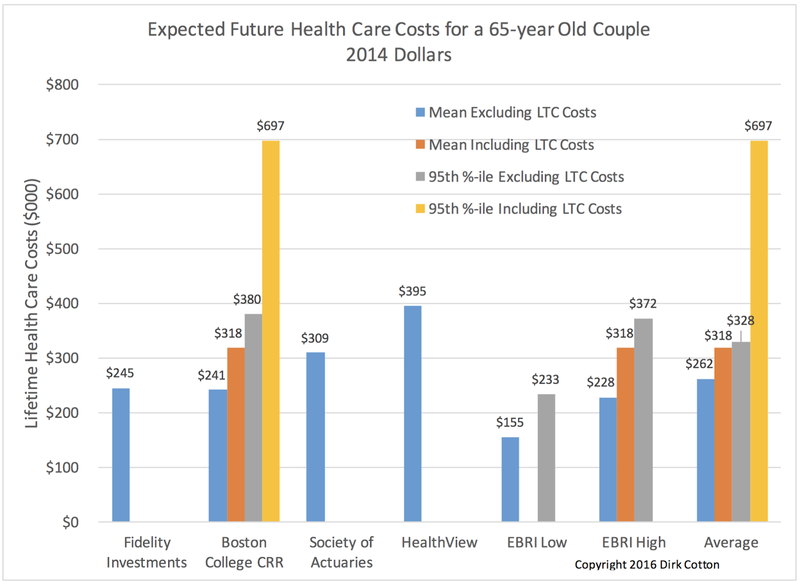 In the meantime, clicking on the post title, "About Fidelity's Health Care Cost Estimate for Retirees", in your email will open it in a web browser on your computer or device where it will be easier to read. I'm new at this game - turning 65 late this year but I have some serious reservations about 245K. At 65 with a 20 year life expectancy we are looking at 12K/yr. Medicare Part B (1200/yr), part D (500/yr. )and a medigap Plan F (2K/yr) would seem to limit the expenditures to about 4K/yr. 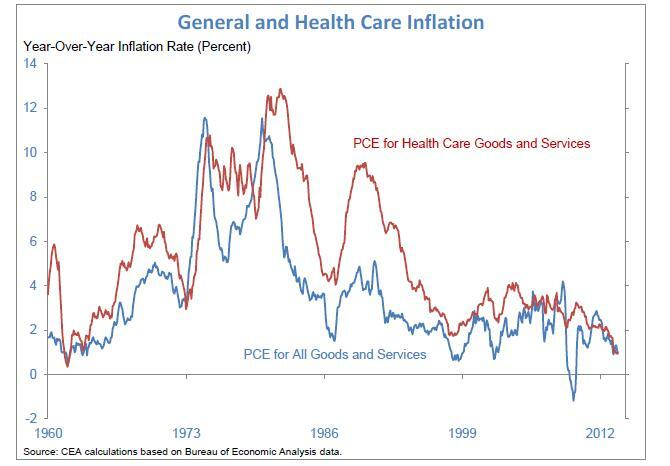 Allowing for health care inflation of 5% would still sum to only about 140K in twenty years. I should think that coverage using medicare (A, B, and D) and medigap (F) policies. would be pretty adequate coverage for a majority of people. You would need to be hospitalized for over a year or in a skilled nursing facility for more than 100 days to have serious cost increases. With so many retirees dependent wholly (or nearly so) on SS benefit (average 15K/yr.) it is hard to imagine the health care cost could possibly be 12K/yr. As I stated to start - I'm new at this and have probably overlooked something. There are two issues with your analysis. Your assumption seems to be that, once you’ve paid the insurance premiums, you’re pretty much through paying for health care. Several studies show that people routinely and significantly overestimate the percentage of health care costs that will be covered by Medicare. This column will point you to some of the research. The second issue is your assumption that $245,000 of lifetime costs equate to about $12,000 over 20 years. The average cost of health care at each age increases with age. The average health care cost for a 95-year old male is much greater than that for a 65-year old male. That is quite different than your assumption of $12,000 per year at every age. You may be assuming that $245,000 is the average cost for a couple that lives an average lifespan (about 20 years). It is not. The lifetime expected cost of $245,000 is the average for all 65-year old retired couples, some of whom live to 66 and some of whom live to 106. The lifetime health care costs for those who live a very long time will be far different (and far different per year) than for those who live just a few years. This research doesn’t tell us that expected lifetime costs for a couple that lives 20 years is $245,000. Your estimate is probably not a bad guess for the first few years of retirement, subject to issue 1 above. But, if you live a very long time the costs late in life may dramatically change your cost-per-year estimate. They could also change earlier in life if you have poor health; age isn’t the only factor. The problem with averages, of course, is that there is about a 50% chance that your own costs will be much higher. You need to plan for that, not the average. If you plan on a long life, to say age 95, and reconsider the portion of your health care expenses that will be paid by Medicare, I think you’ll be on the right track. The US is currently spending about 17%-18% of GDP on healthcare (interestingly the S&P Healthcare Sector is about the same percentage of the S&P 500). I don't believe any other developed country in the world spends over 12%, so there are a lot of costs to be cut. Obamacare with electronic records and other requirements is setting the stage for the US to be able to start to execute some of those cuts over the years. I have family in Canada, including elderly parents. Healthcare costs rarely come up in conversation (my parents and their circle of friends have had heart surgeries, cancers, joint replacements, etc.). Canadians rarely go bankrupt due to healthcare costs. They also rarely get denied care without good reason. However, the Canadian system is run with ruthless efficiency with very little duplication of equipment and personnel. There are probably as many MRI machines within 20 miles of my house in the US as there are in entire provinces in Canada. The single payer systems are using their patient data to understand what they need to spend money on and what not to. Traditional supply and demand theory would dictate that having more pieces of equipment, staff etc. in an area would drive costs down but that is not what is happening in the private healthcare system in the US. I suspect that the ideology in the US will eventually give way to much more pragmatic ways of managing healthcare costs in the coming decades. That doesn't necessarily mean single payer systems, but the status quo of five years ago simply won't cut it as I think the GOP will find out if they terminate the Affordable Care Act without replacing it with something more rational and efficient. Re: long-term care costs and nursing home costs - do they factor in the cost of housing, utilities, food, etc. that the person would have been incurring if they stayed in their own home? Nursing homes and hospitals are much more expensive than being in your own home, but the entire cost does not need to be set aside as a unique item. If you look at the papers at the links I provided you can usually see what was included (not the case with Fidelity), but I don't think those items were accounted for by any of the studies. When counting MRI machines, you also need to consider that we have ten times their population. I did find this. "Japan and the United States have 35.3 and 19.5 MRI units per million population, respectively, whereas Canada has only 4.6. 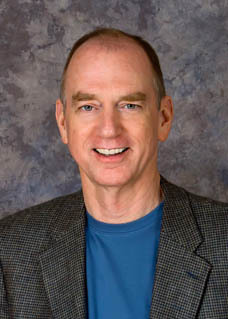 (Stein 2005). So the U.S is way ahead of Canada in MRI machines, but we're way behind Japan. Thanks for your comments. I share your optimism that the problem will be mitigated before we all go broke.